Matt hasn’t eaten in days. His stomach stabs and twists inside, pleading for a meal, but Matt won’t give in. The hunger clears his mind, keeps him sharp—and he needs to be as sharp as possible if he’s going to find out just how Tariq and his band of high school bullies drove his sister, Maya, away. Matt’s hardworking mom keeps the kitchen crammed with food, but Matt can resist the siren call of casseroles and cookies because he has discovered something: the less he eats the more he seems to have . . . powers. The ability to see things he shouldn’t be able to see. The knack of tuning in to thoughts right out of people’s heads. Maybe even the authority to bend time and space. So what is lunch, really, compared to the secrets of the universe? Matt decides to infiltrate Tariq’s life, then use his powers to uncover what happened to Maya. All he needs to do is keep the hunger and longing at bay. No problem. But Matt doesn’t realize there are many kinds of hunger…and he isn’t in control of all of them. A darkly funny, moving story of body image, addiction, friendship, and love, Sam J. Miller’s debut novel will resonate with any reader who’s ever craved the power that comes with self-acceptance. Matt hasn’t eaten in days and if it’s up to him, he won’t be eating for the next days to come either. His sister is ‘missing’, his mom is not really there for him and he’s just not sure what to do with his life. He’s also not sure what to do with his body. When he finds out he has some kind of magical powers when he is hungry, he makes the decision to just stop eating. Without food, he feels stronger. Strong enough to maybe even save his sister. Like I said: it's an interesting story. First of all, Matt is a guy. Every eating disorder book I’ve read until now was from the POV of a girl. Experiencing this disease through a boy is very refreshing. The thoughts are a bit different, yet in the basics very comparable to what a girl experiences. It comes down to controlling at least SOMETHING in his life, but it's also about the way he views himself (he thinks he’s fat – which I thought too at the beginning, but you soon find out it’s not true). Besides his eating disorder, Matt is also gay. Don’t worry, this ain’t a spoiler. It’s not so much a story of coming out, but he does kind of struggle with the fact that he is gay. But in a different way than you might expect. The last thing that really makes this novel stand out, is the fact that you notice right away that getting thinner is not his main goal, but more like a side effect. And that’s what shows how important it is to realize that eating disorders are not always JUST about getting thinner or loosing weight. With Matt, it’s mostly psychological. The writing style is really refreshing. Even though the book sounds really depressing, Matt is a funny guy, reflecting on his life every now and then. He likes to make jokes, but doesn’t pity himself. He just needs to find his sister. Period. The books is divided in multiple chapters all starting with a ‘life lesson’ by Matt. It’s a lesson that teaches you, yes, The Art of Starving. And he finds himself to be the master at that. The plot is interesting as well. It really suprised me. You might think: so yes, this is going to happen. And then… it doesn’t. That proves the plotline is thought through very well. It surprised me. It did get a bit freaky, but I won’t give you any details since I promised not to spoil you. You’ll find out once you’re reading the book that not everything is what it seems to be or what Matt tells you it is. The Art of Starving tells the story of a struggling young man who would rather die than not find out what happened to his sister. His eating disorder makes him an untrustworthy POV, which makes the novel all the more interesting. The book is well written, touching and above all very original. I couldn’t stop reading and was addicted to Matt until the very last page. I recommend it to everybody who’d like to read a book that has a refreshing take on eating disorders. Matt can’t control much of anything in his life. His dad left when he was a baby. His sister—his primary ally in teenagedom—has run away. His mom is working long hours and struggling to keep her job. Kids at school pick on him because he’s gay. And the school has identified him as at-risk and sent him to a psychiatrist. His life is pretty much a mess, and Matt is focusing on the two things that he thinks he can control—revenge on the boys he has decided are responsible for his sister, Maya, running away, and depriving his body of food. THE ART OF STARVING is a gorgeous and heartbreaking book that had me saying “what the…?” while flipping pages so fast I barely cared about the answer to my own question. While dealing with all of his troubles, Matt’s search for love and acceptance moves beyond the specifics of his situation and speaks to every reader. The author of the book, Sam J. Miller, writes beautifully and weaves magical realism with an unreliable narrator in such a way that put me in a mode that was as uncomfortable and off balance as the book’s protagonist—but at the same time left me wanting to believe that all of Matt’s experiences were real. This is a book that I’ll want to read and re-read in order to glean those beautiful and sometimes painful truths that the author has hidden in Matt’s story. 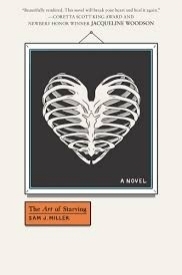 My thanks to Sam J. Miller for a fantastic book, and to YA Books Central and the publisher for an advance copy of THE ART OF STARVING in exchange for my unbiased review.